The more I see of Defiance, the more I like it. The latest trailer features some sweet new weapons and modifications. I'm not really sure how the mod system works, but it looks like players will be able to adapt weapons to their specific playstyles --especially if those playstyles focus on using biological weapons and high explosives. I think I even saw a mortar launcher with a bayonet attached to it. Hey, if you want to mix and match artillery and melee combat, that's fine with me. Defiance is an MMO shooter which boasts a robust single player, cooperative, and multiplayer experience. Players will take the roll of Ark Hunters and fight to save mankind. You may have heard this story before, but now you can play with a whole lot of people. I'm very curious to see how consoles will handle the game. In what should come as no surprise to anyone, a Defiance Season Pass has recently been announced. The Season Pass will cost $39.99 on PC and PS3 and 3200 MSP on the 360. This will get you the first five installments of DLC. You'll also get "a new playable alien species, new weapons and vehicles, missions, and rewards, plus two bonus items, an exclusive digital Hellbug combat cap and a Lock Box." I have no idea what the Hellbug combat cap does, or what the Lock Box is, but I know I want them. 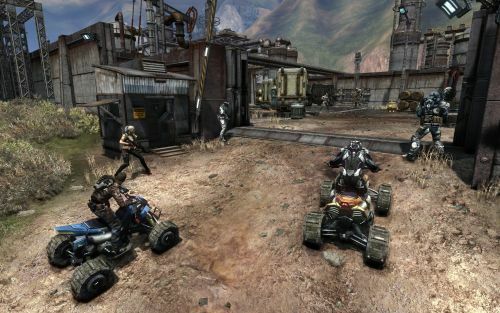 Defiance will support up to 16 player online co-op. It will launch on the Xbox 360, PlayStation 3, and PC on April 2nd. The accompanying Syfy TV series will soon follow. Should be interesting. Page created in 0.3224 seconds.